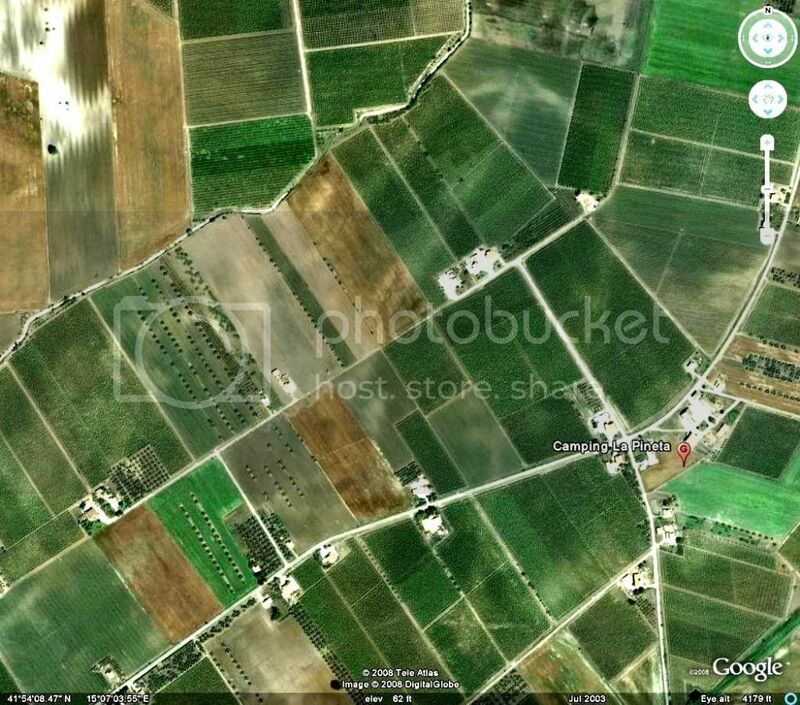 Home of the Red Tails from June 44 to May 45, Ramitelli Airfield 25Feb45. A current view of the site where Ramitelli Airfield was located. If you look closley you can see portions of where the PSP runway and taxiways where. 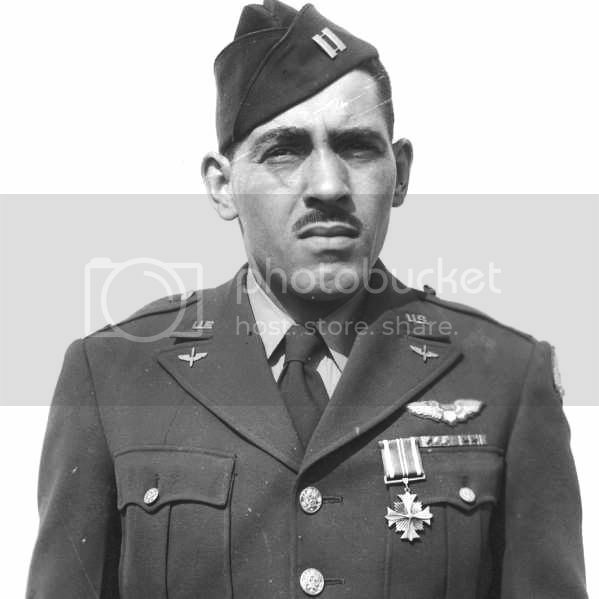 "Jet Killer" 1st Lt. Roscoe C. Brown 100th FS. 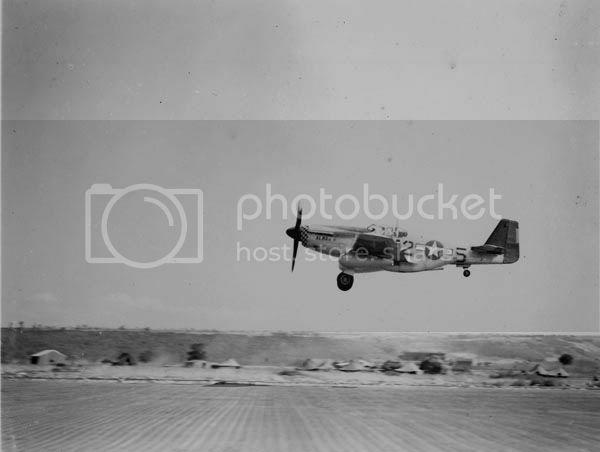 Credited with 1-ME-262 on 24Mar45 and 1-FW-190 on 31Mar45. 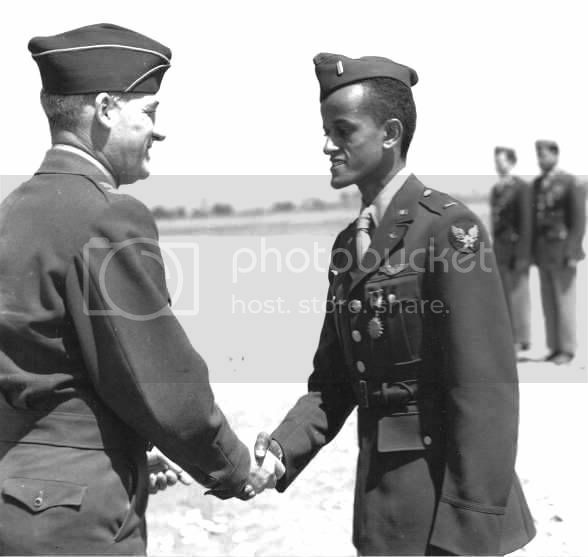 Major General Twining is seen awarding 2nd Lt. John L. Whitehead, aka "Mr. Death" 301st FS the Air Medal in April 1945. 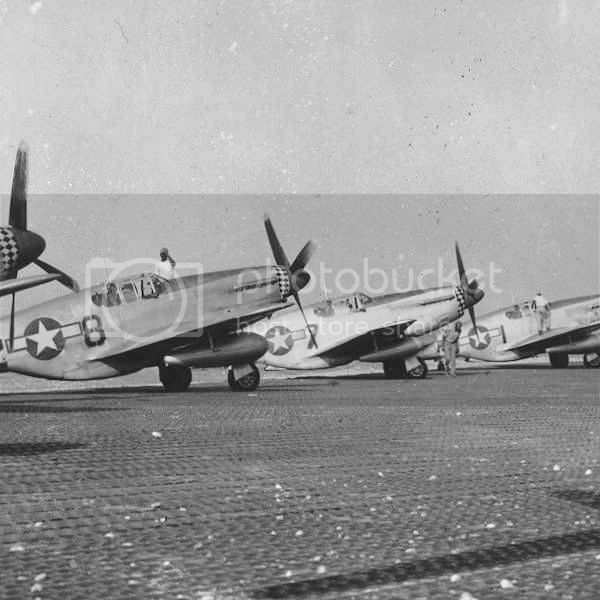 Represenatives from each of the 4 Fighter Groups assigned to the 306th Fighter Wing. 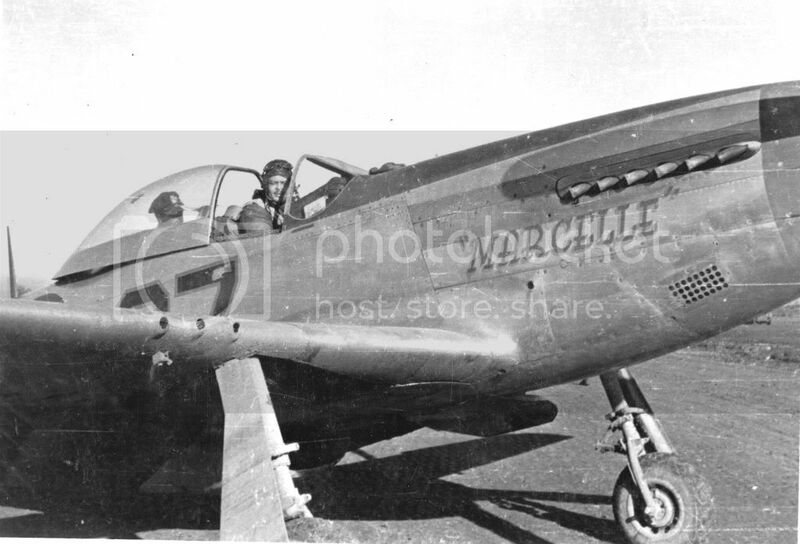 1st Lt. Roscoe C. Brown is piloting P-51D #7. 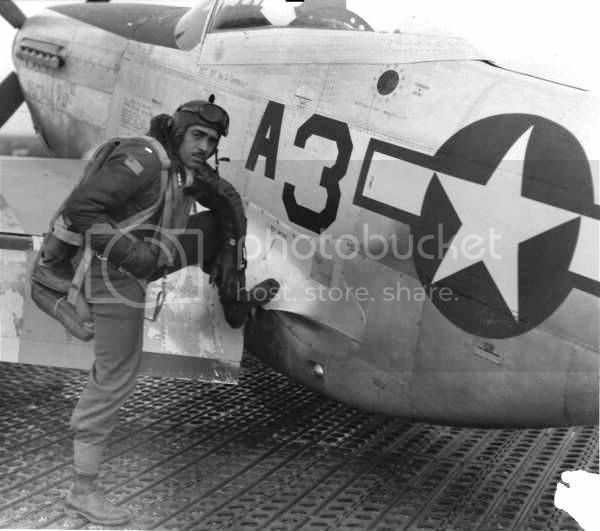 Magor George S. Roberts is seen with a unidentified passenger in the 332nd FG's piggyback mustang. The ship was a old war-weary D model. Note that all of the guns have been removed. Tuskegee airman Edward C. Gleed, Lawrence, KS, Class 42-K, with two unidentified crewmen adjusting an external seventy-five gallon drop takn on the wing of a P-5/D, "Creamer's Dream." Ramitelli, Italy, March 1945. Col. Benjamin O. Davis presenting war bond for best kept A/C. Left to right: Crew chief Marcellus G. Smith, Louisville, KY, 100th F.S. ; James A. Walker, Manning, SC, 43-E; unknown airman; George S. "Spanky" Roberts; and Davis. standing, Woodrow W. Crockett, seated, Edward C. Gleed, Lawrence, KS, Class 42-K, Group Operations Officer. 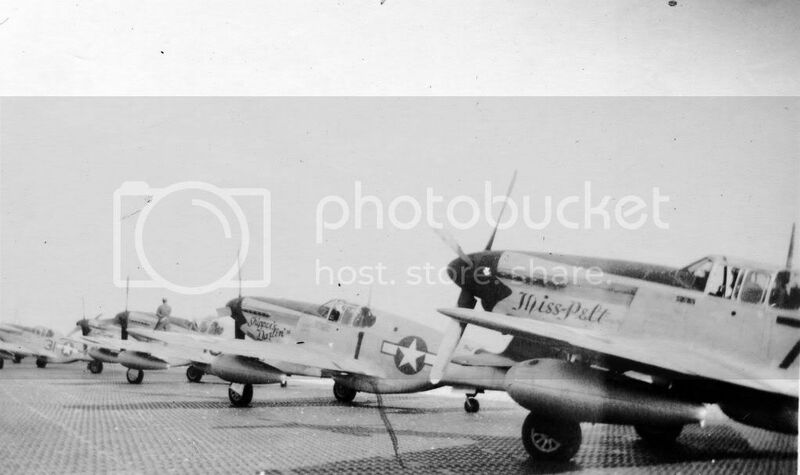 Ramitelli, Italy, March 1945.
several Tuskegee airmen attending a briefing. First row: 1. Hiram E. Mann, Cleveland, OH, Class 44-F; 2. Unidentified; 3. Newman C. Golden, Cincinnati, OH, 44-G; 4. Bertram W. Wilson, Jr., Brooklyn, NY, 44-E; 5. Samuel W. Watts, Jr., New York, NY, 44-E. Second row: 6. Armour G. McDemoe, Martinsville, VA, 43-A; 7. Howard C. Gamble, Charles Town, WV, 43-K; 8. Harr;y T. Steward, Jr. Corona, NY, 44-F; 9. Earle R. Lane, Wickliffe, OH, 44-D; 10. Wyrain T. Shell, Brooklyn, NY, 44-F? ; 11. Harold M. Morris, Seattle, WA, 44-D; 12. John E. Edwards, Steubenville, OH, 44-C; 13. John H. Porter, Cleveland, OH, 44-C; 14. James H. Fischer?, Stoughton, MA44-G; 15. Wyrain T. Shell, Brooklyn, NY, 44-F? ; Third row: 16. William E. "Porky" Rice?, Swarthmore, PA, 44-G; 17. Tony Weaver? ; 18. Charles L. White?, St. Louis, MO, 44-C; 19. George Arnold Lynch, Valley Stream, NY, 44-F; 20. Samuel L. Washington, Cleveland, OH, 44-F; 21. Calvin J. Spann, Rutherford, NJ, 44-G; 22. Frank N. Wright, Elmsford, NY, 44-F. At Ramitelli, Italy, March 1945. Tuskegee airmen leaving the parachute room. Left to right: Richard S. "Rip" Harder, Brooklyn, NY, Class 44-B; unidentified airman; Thurston L. Gaines, Jr., Freeport, NY, Class 44-G; Newman C. Golden, Cincinnati, OH, Class 44-G; Wendell M. Lucas, Fairmont Heights, MD, Class 44-E. Ramitelli, Italy, March 1945. 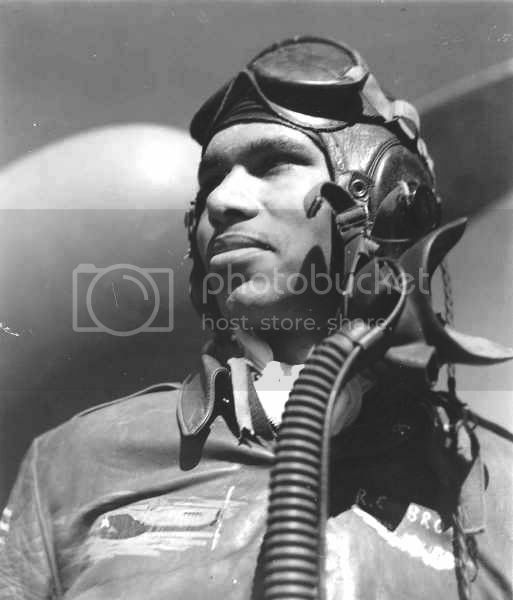 Tuskegee airman Edward M. Thomas of Chicago, IL, Class 43-J. 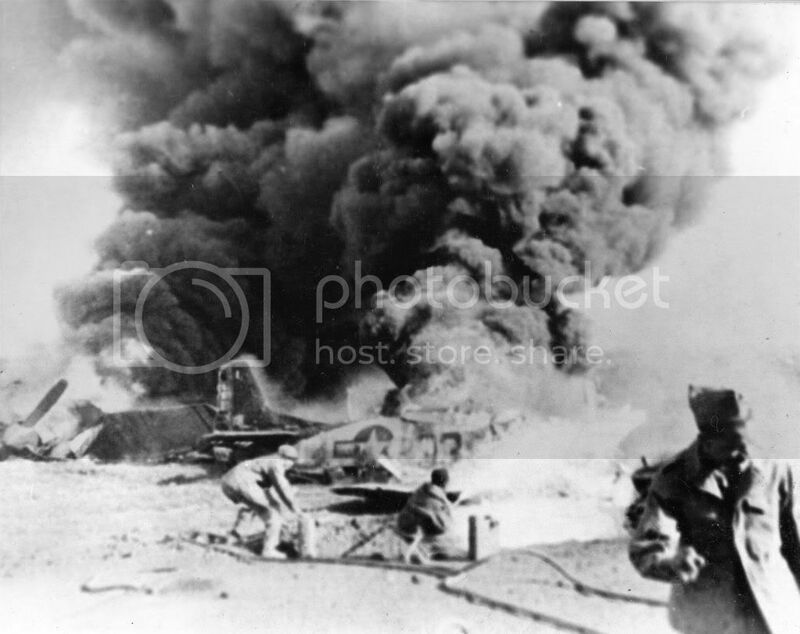 Ramitelli, Italy, March 1945. Deputy Group Commander George S. "Spanky" Roberts with photographer Toni Frissell, at Ramitelli, Italy, March 1945. 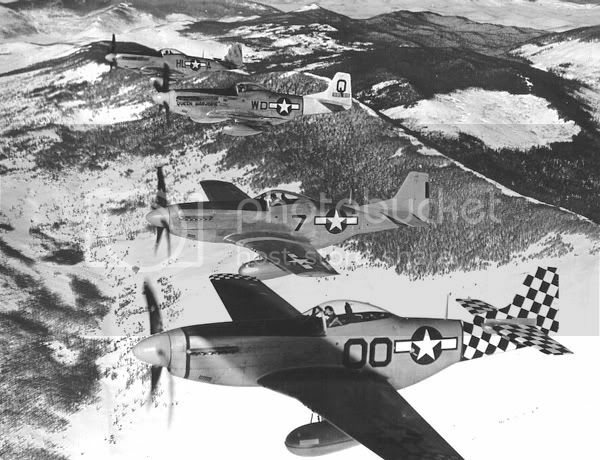 Frissell wrote "Just before take off in stripped down mustang--no guns--for rendezvous with the fighter pilots." Aircraft is a P-5/D, number 37, with three German crosses in front of the number. It was named "Marcelle" and was assigned to Group Headquarters. It is shown configured for "Piggyback." Sgt. William P. Bostic, 301st F.S. in control tower. Control tower directed traffic with red, amber, and green lights and a flare gun to indicate special situations. Ramitelli, Italy, March 1945.